The center of the British Empire, and to the English, the world! 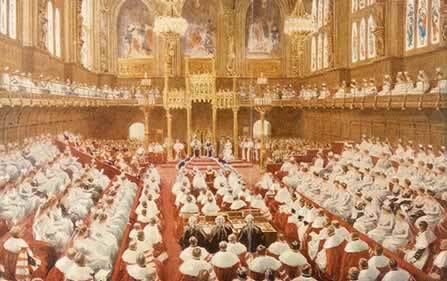 The House of Lords measured 100 feet by 50 feet, and was decorated in solemn hues of gold and crimson, with lofty stained-glass windows depicting the past kings and queens of England. 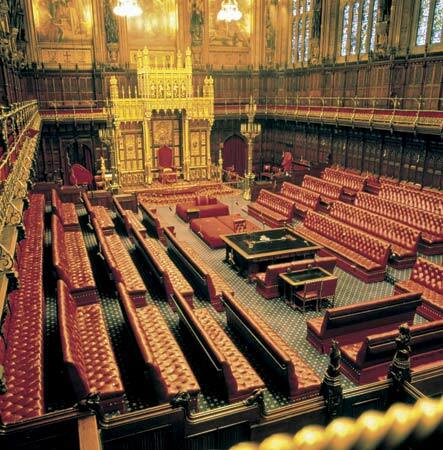 At the end of the Chamber was a canopied throne of gold where the reigning monarch sat when opening Parliament. On the steps to the throne the eldest sons of peers and privy councilors were privileged to stand during the sittings of the House of Lords. Immediately before this was the Woolsack, a red ottoman upon which the Lord High Chancellor presided over the House. Unlike the Speaker of the House of Commons, the Lord High Chancellor could take part in debate. At his right sat the Lords Spiritual–the Archbishops and Bishops. To their right were the peers supporting the current Government with the Ministers seated in front of them. Opposite them sat the Opposition peers. In front of the Lord Chancellor was a table, upon which lay volumes of Parliamentary procedure and writing materials, where three clerks in wigs and gowns sat. Facing this was a desk for the reporters of Parliamentary debates, who relieved one another every fifteen minutes. Near the strangers’ gallery were three or four benches in the center of the floor, facing the Lord Chancellor, known as “the cross benches,” upon which sat those Princes of the Blood Royal who had been created peers of the realm and who, though they were allowed to vote, belonged to no political party. A few peers also chose to be seated thus. Behind these benches was the place known as “the Bar,” where the Speaker and the members of the House of Commons stood when summoned by the Black Rod to the House of Lords to hear the Royal assent signified to the Bills agreed upon by both Houses. The divisions in the House of Lords mirrored that of the Commons, except the peers declared themselves in the Old Norman French “Content” or “Non Content” rather than “Aye” or “No,” and the tellers counted these votes with a white wand. Also present in the House of Lords were the peeresses, whose galleries lined both sides of the Upper Chamber, foreign Ambassadors, invited guests (“Strangers”), and reporters, who each also possessed galleries of their own. But unlike the House of Commons, where the sexes were separated into their own galleries, ladies and gentlemen could sit together. 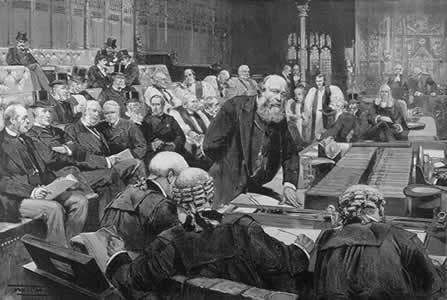 Contrary to popular belief, most peers sat regularly in the House of Lords, and throughout the nineteenth century, attendance reached its peak in the 1830s, 1850s, 1870s and late 1880s–no doubt spurred on by such issues like the Irish Question or the Deceased Wife’s Sister Act. However, sittings were usually brief, a quarter of an hour not infrequently the length of a sitting. Sometimes a sitting might have extended to an hour, on still rarer occasions it prolonged until seven pm, and at times on two nights of a Session of seven or eight months’ duration, the sitting could last until midnight. But it was more likely that newspaper reports would announce the adjournment of the House fifteen minutes after it first sat. Far from being lazy, the reasons behind these short sessions was because the House of Lords was practically barred from initiating legislature of an important nature. 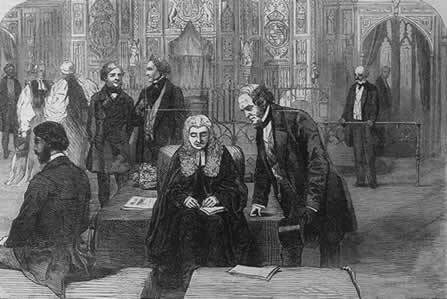 Sittings in the House of Lords began at four, though as a rule, no business was done until half-past four, and during this interlude, the Lord Chancellor would essentially twirl his thumbs. The number of peers of the realm fluctuated over the years, but generally hovered around five hundred and seventy. Where the House of Commons required forty members to “make a House,” three peers formed a quorum, but if it appeared on a division that thirty lords were not in attendance, the question was declared not decided. When the Government changed, the parties crossed to floor, with the “ins” sitting on the benches to the right of the Lord Chancellor, and the “outs” occupying those on his left. The Lords Spiritual always occupied the same benches on the Government side of the House, near to the Throne, no matter which party was in office. Twenty-six in number–the Archbishops Canterbury and York, and twenty-four bishops–were distinguished from the Lords temporal by their full, flowing black gowns and their lawn sleeves. 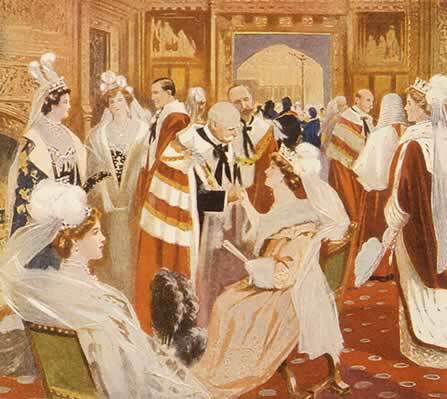 The peers in the House were much more soberly dressed except at the opening of Parliament by the Sovereign, whereupon they appeared in scarlet robes, slashed across the breast with stripes of ermine, few or numerous according to the low or high degree of the wearer in the peerage. Though the Lords temporal–royal peers, dukes, marquesses, earls, viscounts and barons–were allotted certain benches according to their rank, they only sat thus during the opening of Parliament. Opinion of the day claimed that speeches made in the House of Lords were of an eloquent and more able quality than those made in the Commons, for members of the lower house spoke as often as possible to get their names in the papers. The demeanor was quite different in the Lords as well–none of the fury and raucous which characterized the doings in the Commons. But if order cannot be maintained, the procedure of the House provides for the quelling of the disturbance by the reading by the Clerk of two old Standing Orders in relation to asperity in speech and quarrels in the Chamber. Though of lesser political power, the House of Lords was the Supreme Court of Appeal from the Courts of Justice of the United Kingdom. If a claimant felt an injustice was done him by the decision of any of the law courts, they could come to the House of Lords, whose judgment on the matter would be final and irrevocable. This court sat on Mondays, Tuesdays, Thursdays and Fridays throughout the legal year from 10:30 am to 4 pm, and gravity, dignity and decorum reigned supreme. No witnesses were examined, nor was there a jury, and sparring between opposing lawyers was unheard of. The lawyers would address the House at the Bar and lay down, in placid, conversational style, the facts of the case and the points of law on which he relied for judgment. After both sides presented their case, the House would adjourn and the parties involved would be informed of the day on which the House would deliver its decision. The trouble began when in 1909 David Lloyd George, the Chancellor of the Exchequer, introduced into the House of Commons the “People’s Budget”, which proposed a land tax targeting wealthy landowners, among other benefits for the common people of England. This bill was immediately defeated by the House of Lords, and in response, the Liberal Party made the curtailing of the House of Lords’ powers their primary campaign issue for the General Election of January 1910. The chaos produced by this was enormous, and King Edward let it be known his willingness to raise men to the peerage to force the bill to pass through the House of Lords. He died in May however, before he could implement this, and when the Conservative Party, with their Liberal Unionist allies, gained more seats than the Liberals, the fight intensified. After another general election in December, the Asquith Government secured the passage of a bill to curtail the powers of the House of Lords. 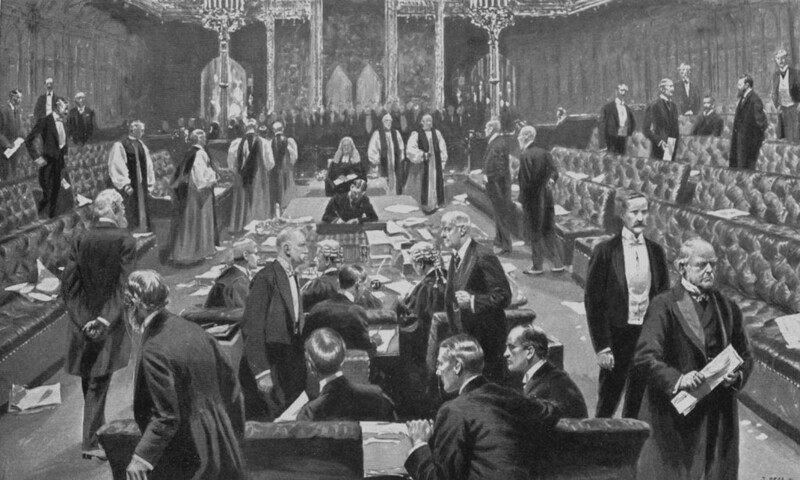 In the end, The Parliament Act 1911 effectively abolished the power of the House of Lords to reject legislation, or to amend in a way unacceptable to the House of Commons; most bills could be delayed for no more than three parliamentary sessions or two calendar years. According to E. Beresford Chancellor, if “we sought for one particular feature distinguishing London from the other capitals of Europe, apart from its immense proportions, it would probably be found in the number of its large houses–many of which are indeed private palaces.” Mayfair had not always been fashionable, and long after the areas of Bloomsbury, the Strand, and the even the City of London itself, had been abandoned by fashionable decree, the old private mansions remained. 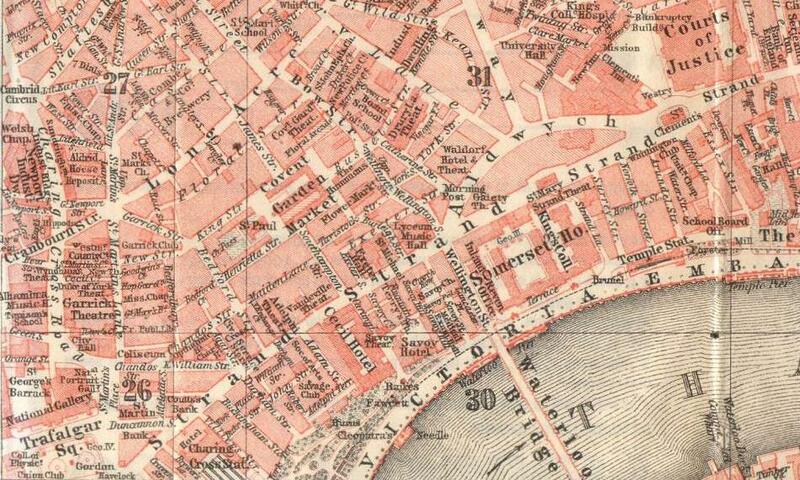 By the late nineteenth century, the private palaces of London clustered together along Piccadilly and Park Lane. However, a few mansions of note sat above Oxford Street, such as Portman House in Portman Square, Hertford (formerly Manchester) House in Manchester Square, and in other places in the West End–Montague House in Whitehall, and Stafford House in the heart of St. James’s. And lest we forget, the Prince of Wales’s London residence, Marlborough House, sat in Pall Mall. Click to open map of Mayfair. In the Edwardian era, the most fashionable mansions, which frequently were the sites of the most exclusive social affairs and the most influential of political events, were Devonshire House, Dorchester House, Stafford House, and Londonderry House. 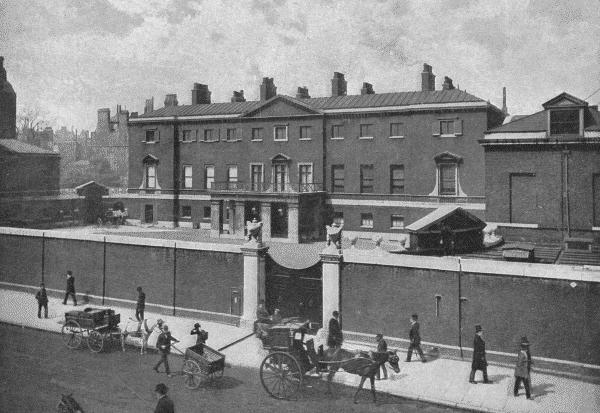 At first glance, Devonshire House appeared a plain, somewhat ugly mansion obscured by a high, solid wall. Forever immortalized by the antics of the 5th Duke of Devonshire and his two 5th duchesses Georgiana and Elizabeth, Devonshire House remained largely the same as when that menagerie resided within its tony walls. The mansion sat right on Piccadilly, an extremely busy and noisy thoroughfare–no doubt the reason for its walls. When the 8th Duke of Devonshire ascended to his title in 1891, and married his longtime lover Louisa Manchester the following year, Devonshire House became the center of London political life. The energetic and influential Louisa wielded her power from the mansion, and in 1897, she threw one of the most magnificent costume balls late Victorian society had ever seen. Not only English society, but Indian princes and princesses, American millionaires, and Continental aristocrats, attended this ball attired in sumptuous costumes worth thousands upon thousands of pounds. Despite her advanced state of pregnancy, Consuelo Marlborough recalled being laced tightly to fit into her costume, and finding her pleasure dimmed when walking across Green Park at dawn to see a number of homeless, wretched men sleeping in the grass. After the 8th duke’s death in 1908, Devonshire House passed to his nephew, who like aristocrats in the interwar era, abandoned his expensive, unnecessary London mansion and consigned it for demolition. This was also the hub of Anglo-American society, for Senator Whitelaw Reid was appointed American ambassador to St. James’s Palace in 1905, and rented the palace at a cost of $40,000 a year (about $960,000 in 2009 dollars). His lavish expenditure set the tone for American diplomats abroad, and very quickly it became apparent that the annual salary of $17,500 (about $400,000 in 2009 dollars) for a diplomat was not enough–which gives us a fair clue why it became the practice to choose wealthy men for diplomatic posts. Here Americans rang in the Fourth of July, and it was from Dorchester House where Alice Roosevelt Longworth prepared to make her court presentation to the King and Queen. After Reid died in 1912, the house was abandoned by the American diplomatic service as his successor, Walter Hines Page, was a man of much simpler tastes and fortune. During WWI the house was used as a hospital, and it was pulled down in 1926. Stafford House was the London residence of the 4th Duke of Sutherland. 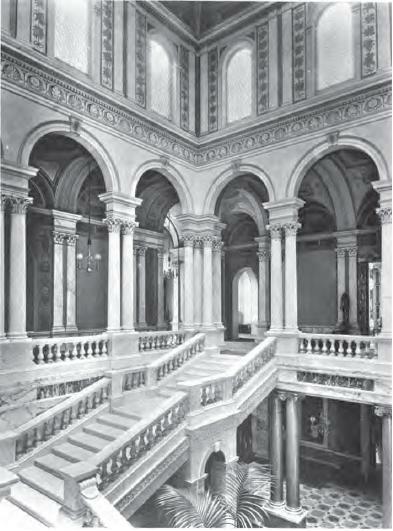 His wife, Millicent, whose descent down the gorgeous stairway figured in so many Edwardian memoirs, was half-sister to Daisy, Countess of Warwick, and associated with both the Marlborough House Set and the Souls–a unique event, for the aims of the two social circles rarely, if ever, met. The home was initially built in the 1820s for the Duke of York and Albany, and was known then as York House. After the duke’s death in 1827, the home was but a shell, but it was quickly purchased by and completed for the 2nd Marquess of Stafford, and it was known as Stafford House from then on. So magnificent was the mansion, Queen Victoria is said to have remarked on a visit, “I have come from my House to your Palace.” The family were liberal in politics, and the 2nd Duke and Duchess of Sutherland entertained distinguished guests such as Harriet Beecher Stowe and Italian revolutionary leader Giuseppe Garibaldi in the 1850s, and the 4th Duke and Duchess followed in that tradition by extending an invitation to Dr. and Mrs. Booker T. Washington. After the 4th duke’s death in 1913, the house was sold to Sir William Hesketh Lever, who renamed it Lancaster House in honor of his native county of Lancashire, and donated the home to the nation in 1913. Lancaster House was the temporary residence of the London Museum between 1924 and 1944, and since then has been used for private government receptions. 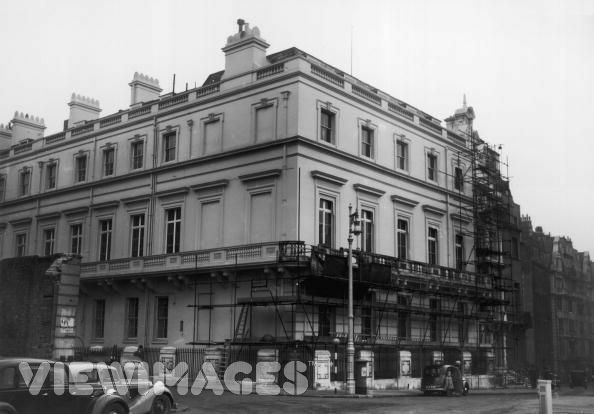 Also on Park Lane was Londonderry House, the residence of the Marquesses of Londonderry (pronounced “Lundundree”), the Anglo-Irish family of which Robert, Viscount Castlereagh, is the most well-known. Londonderry House was originally known as Holderness House, as it was formerly the residence of the Earls of Holdernesse, whose title went extinct with the death of the last earl in 1778. The house was purchased by the Londonderry’s in 1819 as a London residence for the family, who spent considerable time on their estate in Ireland. It was completely rebuilt and enlarged by the 3rd duke during the early 1850s, and at his death in 1854, the mansion rivaled Dorchester House and Stafford House for elegance. By the time of the 6th Marquess’s ascension to the title in the 1880s, the Londonderry’s had become staunch Unionists. The Marchioness in particular opposed Home Rule for Ireland and quickly gained prominence as a Conservative Party leader, going on to form the Ulster Women‘s Unionist Council in 1911. However influential and powerful Theresa Londonderry was, her political clout has been overshadowed by the extraordinary rift between she and her husband after his discovery of her affair with another man, and the possibility that his youngest son was not his own. Londonderry House remained in the family’s possession until 1965, when it was sold to the neighboring Hilton, and demolished to enable the hotelier room for expansion. After the Great War, the great London mansion and the accompanying social and political power attached to its grandeur began to pall. Not only had the winds of politics changed (the Labour Party began to dominate the British landscape), but these houses were unwieldy and expensive to maintain. Those that hadn’t already been opened to the public either followed suit or were shut up or, as in most cases, sold and demolished. 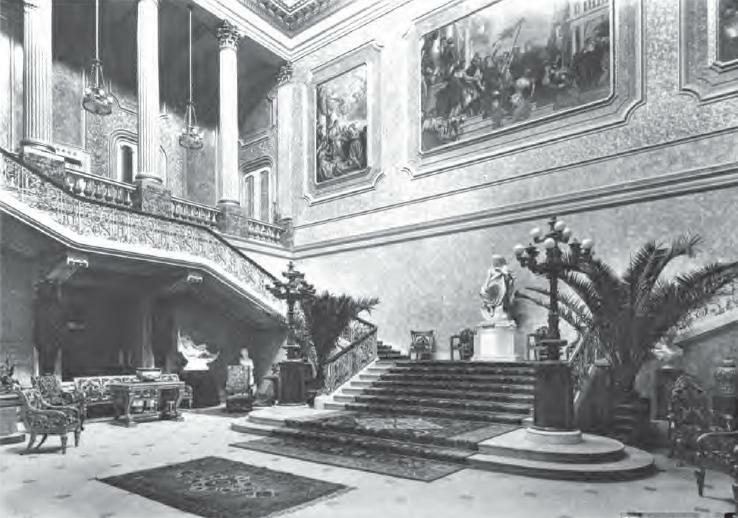 Though these palaces may have disappeared (with the sole exception of Stafford/Lancaster House), and others not detailed have as well, there are many who continue to exist–Lansdowne House, Spencer House, Apsley House, etc–and continue the albeit “spiritual” link between today and Edwardian London. “The Cost of Representing America Abroad.” New York Times, April 5, 1908. Wikipedia entries for Stafford House, Marquesses of Londonderry, Dukes of Sutherland, and Millicent Sutherland. Spent the night together in Trafalgar Square. And each had his portmanteau in his hand. Let’s all go down the Strand — Have a banana! Let’s all go down the Strand! I’ll be the leader, you can march behind. Come with me and see what we can find! Oh! What a happy land. All among the girls and boys. So let’s all go down to the Strand. 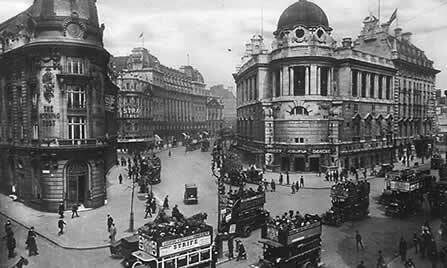 The Strand began at Trafalgar Square and ended at the Courts of Justice, from whence it turned into Fleet Street, and led into the City. A direct route to the financial heart of London, the Strand was justifiably crowded and jam-packed with pedestrians, hansoms, omnibuses and carriages from dusk to dawn. The Strand was originally the shore by the river Thames, and after a brief stint as an open highway scattered with a few houses here and there, it quickly developed into a premiere residential area, lined with palatial mansions whose gardens stretched down to the Thames. The residents ranged from Prince-Bishops, to the highest nobility, to even royalty–which is why many of the streets retain the names of Buckingham, Salisbury, York, Norfolk and Exeter. As fashion moved west, the Strand was abandoned by the aristocracy and the palaces were removed and shops took their place. Until its destruction in 1874, Northumberland Palace, the London residence of the Dukes of Northumberland, and Somerset House (which remains to this day), were the last of these 17th century palaces to remain along the banks of the Thames. 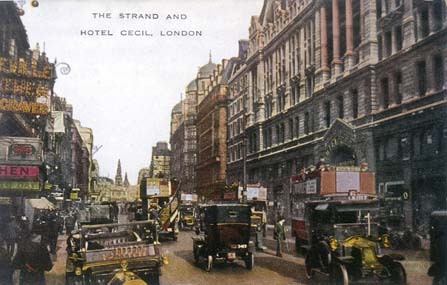 Other definite changes to the Strand occurred during the later half of the 19th century, when the redevelopment of the area in the 1890s led to the demolition of the Globe Theatre, the Opera Comique, which saw the production of many of Gilbert and Sullivan’s wildly popular operettas of the 1870s and 1880s, the Royal Strand Theatre, and the Gaiety for the construction of a new road, Kingsway between Holborn and the Strand, and the crescent wedge between them, Aldwych. On that wedge the New Gaiety Theatre was reopened in 1903, and the attendance of the King and Queen of England to the opening performance legitimized the musical comedy as a respectable form of entertainment. But the most important development along the Strand were the grand hotels and restaurants which sprang up in London seemingly overnight, the most important being Claridge’s and the Savoy. Claridge’s retained its reputation for elegance and aristocratic favor from the day of its founding in 1812 as Mivart’s Hotel. 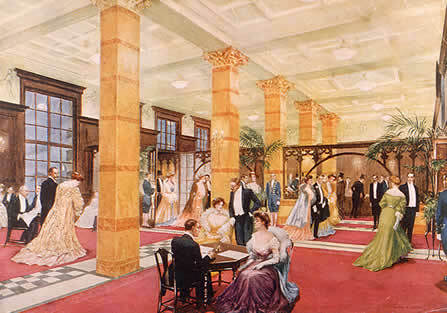 The subsequent visits made by Empress Eugenie and Queen Victoria in the 1860s cemented this reputation, and when Richard D’Oyly Carte, who founded the rival Savoy Hotel, purchased Claridge’s in 1894, he set about revamping the hotel with the latest amenities. It reopened four years later with elevators, suites and a stunning restaurant. The Savoy, was founded by Carte in 1889, and he hired César Ritz as manager, who in turn hired the famous Auguste Escoffier as the hotel’s chef de cuisine. So popular was the Savoy, as both a hotel and a restaurant, it soon became the spot to be for celebrity sighting in the 1890s and 1900s. It was in the restaurant of the hotel where Escoffier invented dishes which became a standard in modern French cuisine, and where many famous celebrations were held. 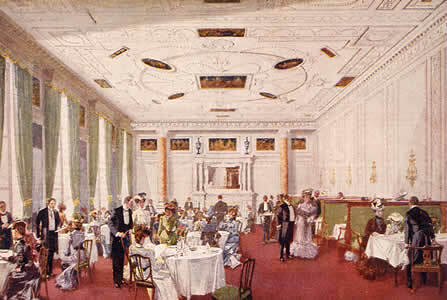 The new trend in dining out also compelled many traditional and traditionally-male enclaves, such as Simpsons-on-the-Strand, to open their dining rooms to ladies. It is here where Margaret Schlegel of E.M. Forster’s Howards’ End has lunch with Henry Wilcox, his daughter Evie and her fiance, who desire to keep Margaret ignorant of the fact that their home was willed to her by the recently-deceased Mrs. Wilcox. There are moments when virtue and wisdom fail us, and one of them came to her at Simpson’s in the Strand. As she trod the staircase, narrow, but carpeted thickly, as she entered the eating-room, where saddles of mutton were being trundled up to expectant clergymen, she had a strong, if erroneous, conviction of her own futility, and wished she had never come out of her backwater, where nothing happened except art and literature, and where no one ever got married or succeeded in remaining engaged. Largely considered the heart and soul of recreational London, the Strand was where one could discover just about anyone–including a long-lost brother, as an American visitor was shocked and happy to find in 1913.